How we translated findings from Discovery into prototypes that we could test with users and explore the riskier aspects of our intended solution. Healthy Start is a UK-wide statutory passported benefit, funded by the Department of Health and Social Care (DOHSC). 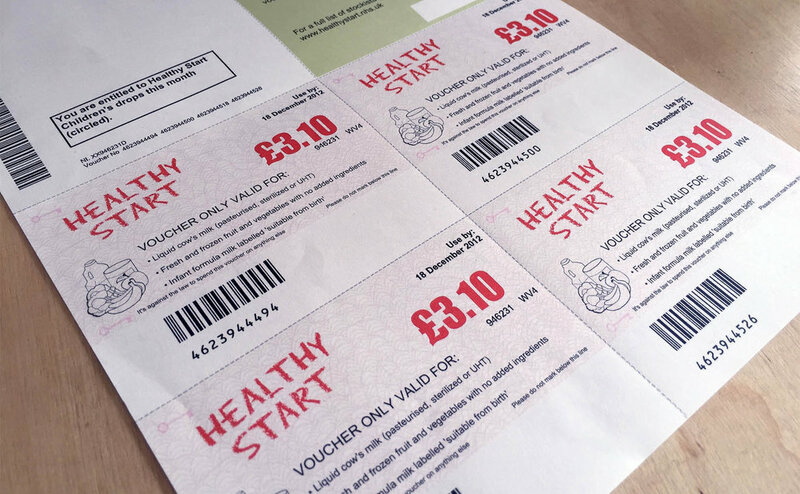 The scheme provides financial support to pregnant women and families with children under four by sending them paper vouchers which can be exchanged for healthy foods in shops. Understand the business, legal, policy and technical constraints and drivers. Generate ideas and how we would test these ideas in Alpha. Following discovery there was a pause in the programme whilst the Department of Health went through an organisational restructure. Pilot Works were then appointed to carry out the Alpha phase. Reducing costs and improving the user experience by replacing paper vouchers. The discovery process had identified potential solutions for each, but they were underpinned by some important assumptions. Our goal in alpha was to test these assumptions - to ensure our new service would meet user needs and deliver the intended outcomes/benefits - in the most efficient way possible. We also needed to continue to help the DOHSC team to adopt agile working practices and create services in line with the GDS Digital Service Standards, particularly as the service would need to pass a GDS Service Assessment before progressing into Beta, and the team were under pressure to avoid any delays. Members of the combined team were located in London, Bristol and Leeds, so we began by creating a shared Google Drive and setting up Slack and Trello as means of ad hoc communication. Then we brought the team together in London for an Inception Workshop to clarify goals, share what we knew and agree roles and ways of working for the alpha. The DOHSC team changed between discovery and alpha so we gave an introduction to user centred design and reviewed the insights from discovery to ensure everyone was aligned on user needs, opportunities and constraints. We split the alpha into two tracks, each focused on a different opportunity. The majority of users wanted to apply for Healthy Start online and many were put off by the existing paper-based application process which requires a signature from a Health Professional. Users were often confused by the language on the current application form, creating pressure on HSIU in the form of unnecessary case work and calls. Our goal was to design an end to end application journey that people with low digital skills could complete quickly and easily using a mobile device. Our content designers reviewed the paper application form and rationalised the questions, re-writing them to make them simpler and clearer for users. We then created an HTML prototype of the application journey using the GOV.UK Prototyping Kit and tested it with users. Feedback from testing was incorporated into the next iteration. After 6 rounds of testing, focused on different aspects of the journey, we were confident the end to end journey was easy and fast to complete, for even our most vulnerable users. The content design on the 'Apply' journey went through six rounds of iteration. During discovery we explored alternative ways to provide Healthy Start benefit to recipients. These included via digital vouchers, via a mobile app and via a prepaid debit card. Of these options prepaid debit cards was a clear winner in discovery, for a range of reasons - they are easy to carry, easy to replace, easy to freeze, they allow for more flexible spending than vouchers and they are not tied to an address. The cards also met the requirements of the HS scheme, such as the need to work with a wide range of retailers and reduce costs of printing and postage. To test our assumptions about how well prepaid cards would meet user needs, we ran a two week pilot with different types of users. We needed to check that the cards would could be used easily in a range of shops, with smaller and larger spends, that users would able to keep track of their balance and that they would prefer the cards to paper vouchers. We recruited 12 users and tracked their usage of the cards, from receiving them in the post and activating them to using them repeatedly in shops. We used WhatsApp to get reports on the user experience and interviewed each user at the end of the pilot to discuss their experiences in more detail. Users liked the speed and convenience afforded by cards and the majority said they would prefer to keep the card rather than go back to paper vouchers. Whether a new online application process would be compatible with regulations of if the law would need to be modified. This was done through a combination of desk research, interviews and workshops. At the start of the Alpha we performed a gap analysis, comparing work completed in discovery with each of the points in the Digital Service Standard and the criteria for the Alpha service assessment. Throughout the Alpha we captured notes on work done against each of the Digital Service Standard points in a shared Google Doc. This helped us to check whether we were on track to meet the standard by the end of Alpha and fed into prioritisation during sprint planning sessions. At the end of the Alpha we helped the service manager prepare for the service assessment, ensuring they had the information they needed and felt confident answering any questions from the panel. And we attended the assessment with the service manager on the day. The GDS panel were extremely thorough and we were delighted to hear a few days later that the service has passed the assessment. We are currently working with the service team to help them scope the delivery of the Beta and live service. Please contact Suzanne How from the Department of Health and Social Care for further information about their experience of working with Pilot Works. We used customer insight to develop a content strategy for a new website that's delivered a 38% increase in conversation rate. We helped this team at Ovo find and prioritise opportunities to solve problems for users and prototype solutions in just two weeks.